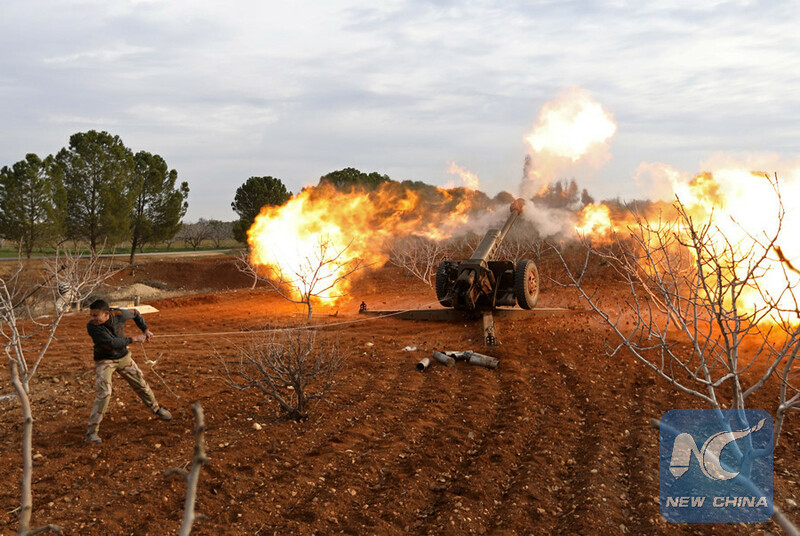 DAMASCUS, Jan. 12 (Xinhua) -- The Syrian army has retaken all the towns lost a day earlier to the Turkey-backed rebels and other militant groups in the northwestern province of Idlib, a monitor group said Friday. Through the counter-offensive by the army in the southern countryside of Idlib, the army has expanded its control to 120 towns since its military campaign in Idlib and the countryside of Hama on Dec. 25, according to the Syrian Observatory for Human Rights. On Thursday, Turkey-backed rebel groups, as well as the al-Qaida-linked Levant Liberation Committee (LLC), unleashed a major offensive to foil the advance of the Syrian army. Opposition activists said the government forces' offensive in Idlib united the rebel factions, adding that the progress of the army could undermine the entire armed insurgency in Syria as Idlib is the major rebel bastion in Syria, following the defeat of the Islamic State (IS) late last year. The rebels, backed by Turkey's Turkistan Party, used Turkish armored vehicles and tanks and brought in most of their forces from the northern countryside of the northwestern province of Latakia and the Jisr al-Shughour area in the northern countryside of Idlib, military officers were cited by state news agency SANA as saying. The Turkistan Party fought against the army alongside the Nour Addien al-Zinki and the LLC, said SANA, adding that the Turkish government has been facilitating the entry of the Nour Addien al-Zinki fighters through the Turkish border. The tactics used by the army forces, however, led to eliminating the attacking forces of the Turkistan Party and Nour Addien al-Zinki as the rebels were besieged from several directions after losing dozens of fighters and commanders in the battle. Meanwhile, the London-based monitor, which says it relies on a network of activists on the ground, said the Syrian army has lost 70 fighters during the battles in Idlib since Dec. 25. Before the rebels' counter-offensive, the Syrian army was fighting to fully capture the strategic Abu al-Duhur air base in southeastern Idlib, as capturing the air base would deal a huge blow to the militants in Idlib and would enable the army to lay a siege to dozens of towns in the nearby southern countryside of Aleppo Province. Idlib has emerged as the main destination of rebel groups, which have evacuated several positions across Syria after surrendering to the Syrian army. The area has become a home to several rebel groups from different affiliations, some of which are supported by Turkey, while others, such as the LLC, are designated as terrorist groups. Parts of Idlib were supposedly part of the de-escalation zones' deal reached between Russia and Turkey, but the Syrian government has expressed rejection to the presence of Turkish forces on the Syrian soil given the "destructive role" played by Turkey during Syria's seven-year conflict. The Syrian government has repeatedly accused Turkey of backing the al-Qaida-linked militants in Syria, including the LLC. Turkey sees Idlib as a place of interest in Syria and the rebels in that area are fighting under Ankara's support. Turkey is also bracing to unleash an offensive on the Kurdish-controlled region of Afreen in northern Syria, according to a recent report by the pan-Arab al-Mayadeen TV. The Syrian government has said it will not tolerate the Turkish presence in Syria, demanding the withdrawal of all Turkish forces from the country.